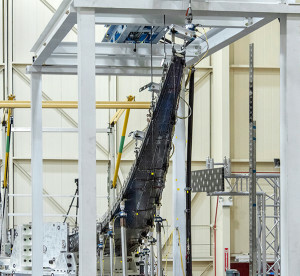 The Passive Aeroelastic Tailored (PAT) wing bends under pressure from the highest loads applied during testing at NASA’s Armstrong Flight Research Center in California. Structural tests on a uniquely designed, high-aspect ratio, light-weight test wing this fall proved new design and fabrication methods. The 39-foot-long Passive Aeroelastic Tailored (PAT) wing could eventually enable full-scale longer, thinner wings that maximize structural efficiency, reduce weight and improve fuel efficiency, said Karen Taminger, an Advanced Air Transport Technology project technical lead at NASA’s Langley Research Center in Virginia. 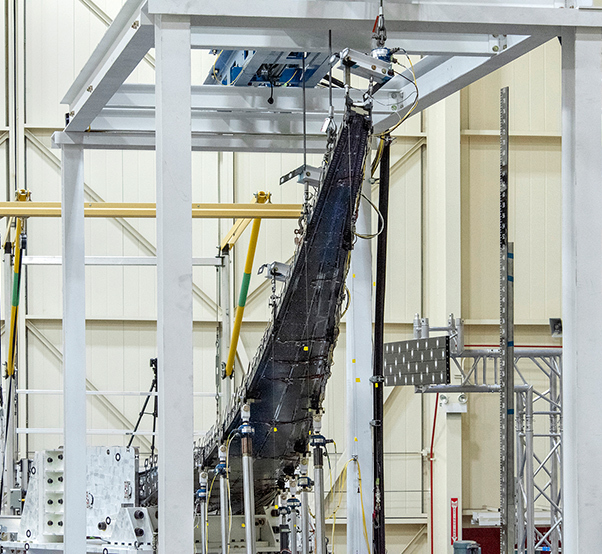 The PAT wing was tested during two phases in September and October at NASA’s Armstrong Flight Research Center in California. 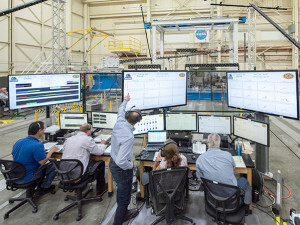 The experimental test article was tested with more than 10,000 sensors, making it one of the most densely instrumented tests articles ever tested at Armstrong. The tow steering composite technology, which refers to the way the carbon fibers are laid out, was used to build the wing skins. The concept was expected to passively control flutter, or vibration on the wings, through structural design that can also help minimize gusts for a smoother ride. The wing bent and twisted at the same time during the design load tests to make it more robust and controllable, but there were tense moments. Ted Powers, from left, Larry Hudson, Ron Haraguchi and Walter Hargis make adjustments to the Passive Aeroelastic Tailored (PAT) wing testing apparatus at NASA’s Armstrong Flight Research Center in California. The wing was more flexible than predicted, as was observed from early on in the October testing. To accommodate the increase flexibility the test team make some modifications in the test setup. Researchers also were pleased by an “unexpected, but hoped for” view of the wingtip turning in on the leading edge as a result of the towed steering concept. From an airflow perspective that would move the loading inboard into the thicker section of the wing where there is more structure that could passively alleviate gusts. Once the models are refined, Taminger wants to see the approximately 30-percent wing scaled up to full size for a commercial transport to assess the benefits. In the end, the amount of fuel that can be saved by using such a wing will determine where the research will go. A longer wing, usually requires more structure, but the tow steering concept could allow researchers the combined benefits of drag and weight reductions which translate into fuel burn advantages. The challenging research had another benefit. 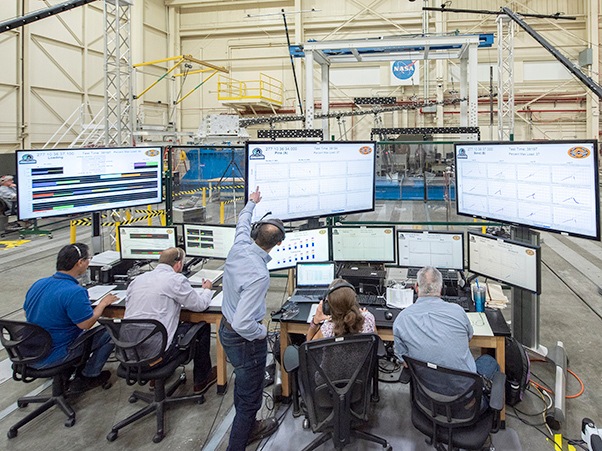 NASA’s Armstrong Flight Research Center and Langley Research Center staff members monitor a test of the Passive Aeroelastic Tailored (PAT) wing at NASA’s Armstrong Flight Research Center in California. The test wing can be seen in the upward sloping area of the test fixture as a black area with white dots, a few feet down from the NASA logo. The project is funded through NASA’s Aeronautics Research Mission Directorate’s Advanced Air Transport Technology project. AATT envisions enabling lightweight wings that are as much as twice as efficient as conventional wings on commercial and military aircraft. 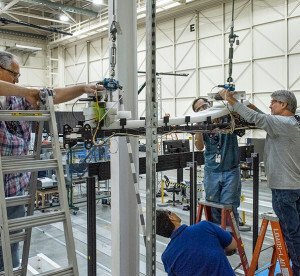 The test wing was designed by Aurora Flight Sciences facilities in Dayton, Ohio, and fabricated at the company’s manufacturing plant in Columbus, Miss.